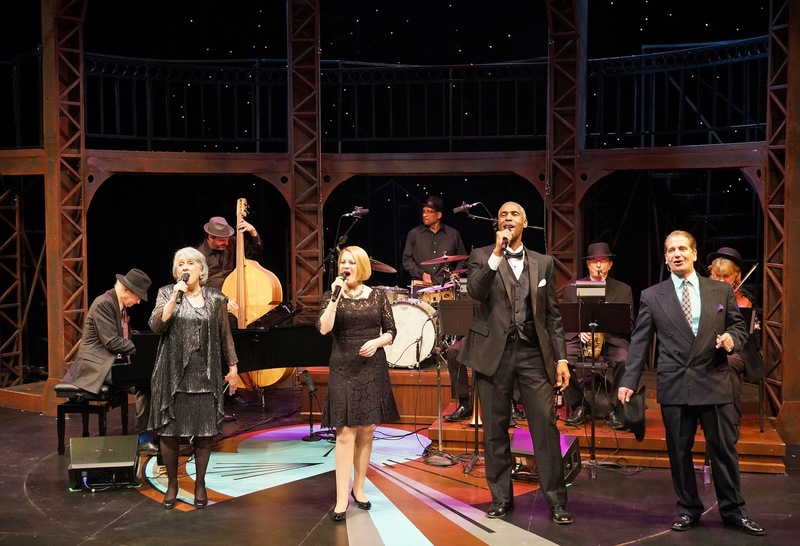 At Park Square Theatre, the soul of Gershwin is alive and well. Specifically, composer George Gershwin, who in his 38 short years was one of the most prolific, influential, and important American composers of the first half of the 20th Century. Joseph Vass's creation The Soul of Gershwin: The Musical Journey of an American Klezmer, which premiered at Park Square in 2011 and for which he won an Ivey Award, is history lesson, play, music theory dissertation, and fantastic concert all rolled into one. This is my first time seeing the show, although I did see the companion piece about George's lyricist brother Ira, the lovely (and awkwardly titled) Words By... Here in The Soul of Gershwin we learn about George's Jewish heritage and how he wove the melodies of the synagogue and the klezmer street musicians into his songs. It's a fascinating examination of how Gershwin's music, so much a part of our culture, came to be. And maybe we need to be reminded of George and Ira's story, the children of Jewish immigrants who became some of the most notable American artists, at this moment in time, when anti-semitism and other forms of bigotry seem to be on the rise. Maybe now is the perfect time to celebrate Jewish music and culture and what a huge influence it's had on shaping American as we know it. As a former clarinet player, when a show opens with a solo clarinet center stage, I know it's the show for me. Specifically, the thrilling portamento from Rhapsody in Blue* (did I mention this show is a music lesson?). Soon George Gershwin himself (as personified by Michael Paul Levin) appears and begins to tell us about his life and influences. He talks about the links between klezmer, jazz, blues, Jewish, and African American spiritual music. But he doesn't just talk about it, he shows us, as we hear a phrase of one next to a phrase of the other in a way that the similarities are obvious. It's just fascinating to see the connection between this familiar 20th Century American music and more traditional forms. Aiding in this music-history lesson are three talented singers known as the chanteuse (Maud Hixson, with an effortless voice perfectly suited to such songs as "The Man I Love" and "Someone to Watch Over Me"), the griot (a soulful Geoffrey Jones), and the chazzan (Maggie Burton, a cantor and opera singer who can also sing the Flinstones theme). They appear onstage whenever Mr. Gershwin needs them to beautifully illustrate a point, as he sits in a big leather chair on the side of the stage smoking a cigar and looking pleased and proud at his creation. But what makes the show is this fan-freakin-tastic band known as Klezmerica, who have performed as a band outside the show and recorded some of their music. I am going to name them all because they're all such incredible musicians, both individually and collectively: Nathan Norman on drums, Doug Haining on clarinet and sax, Adam Meckler on trumpet, Carolyn Boulay on violin, and Chris Bates on upright bass. They are of course led by creator, playwright, music director, and arranger Joseph Vass on piano. The band sounds great playing the range of styles in the show, but they really shine on the traditional klezmer music, in particular the song Heyser Bulgar that I thought would never end, and I hoped it wouldn't (you can listen to a snippet of it here). There's a line in the show about George first experiencing klezmer music as played by street musicians under the elevated train tracks in his native Brooklyn. Set designer Dean Holzman has applied that concept to the two-level set with metal scaffolding, stairs, and balcony. Director Peter Moore makes great use of the space and seamlessly weaves the music and George's musings on music, history, and culture. 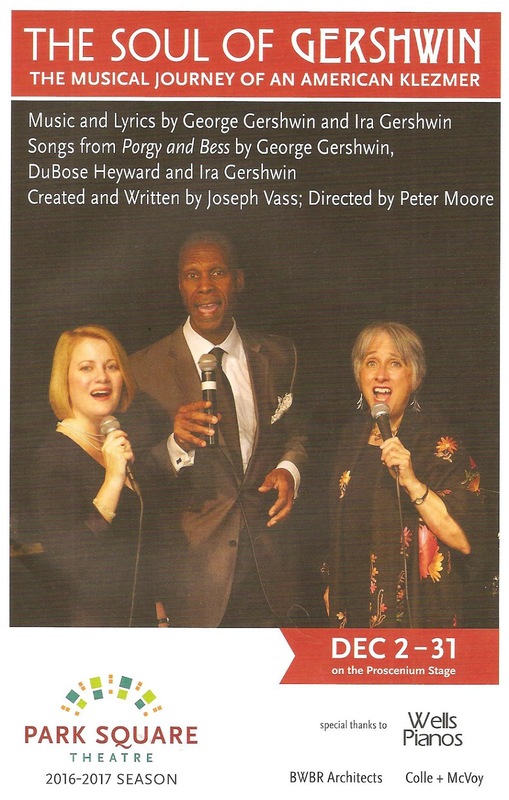 The Soul of Gershwin: The Musical Journey of an American Klezmer is worth seeing just for the fantastic music alone, but as a bonus it also enlightens about the origins of this music. It left me wanting more, but I guess thats happens when a brilliant artist dies way before his time. The world is left wanting more. But at least we can continue to perform, listen to, and celebrate the music he left us. 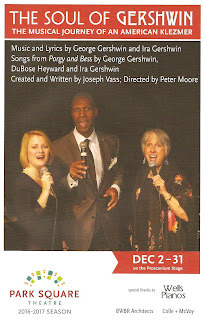 The Soul of Gershwin continues through December 31. *You can watch a performance of Rhapsody in Blue by Leonard Bernstein with the New York Philharmonic on youtube. I dare you to stop before the entire 17 minutes is up, and then to not repeatedly hit replay to listen to this masterpiece over and over again.